Railway is often considered as the lifeline of a country and our India is not an exception. Everyday lacs of people used to travel by rail in different class and also by diverse nature of trains available in this country. Not only the passenger travel, railway is the main source of goods transportation, which provides the best logistic support for trade and commerce. Many historians or research scholar often says that British imperialism is the architect of modern day India (before the British period, India was like a conglomeration of various independent princely states, who were usually at logger-head with each other) and railway is the principal tool to keep the shape of a united nation i.e. India. Railway, being the biggest industry in India and with a cobweb like network, covering almost all corner of the country, attracts the special attention in the government and the proof of this that the railway is the only ministry, which have a separate and independent budget, apart from general budget. Every people eagerly wait for the railway budget and try to connect with the provisions, made in the proposal for formulating a better idea about the implications. This year, in his budget speech Mr. Suresh Prabhu, the Union Railway Minister in Government of India; have not proposed any fare hike in the passenger tariff and at the same time proposed lots of provisions for passenger safety, better service, amenities, comfort and compliance. Not only for passengers even for the cargo operations, there are some special provisions. One of these modern facilities is the complaints and compliances in both passenger and cargo operations. Though the complaint option was there for a long time but this time only a modernized and potential option of observance has been proposed. Now, one can registered a complaint, with the help of the web portal available with the railway or through an app, designed for android supported devices. 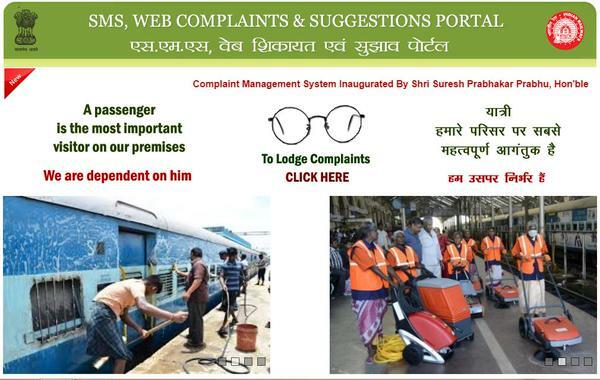 This portal is not only for complaint alone but for the suggestions as well. This Customer Complaint Web Portal has been launched keeping in mind for a better and easy service for esteemed clientele. This facility is completely a free service and the user will enjoy it, without paying any price for the same. With the help of this web portal and the app; the Indian Railway will be recognized with global frontrunners in passenger amenities. After downloading the Customer complaint portal and the app; the user will enjoy the unique feature of tracking the complaint status, which has already been registered in proper manner. Another very useful feature is; the Railway will provide a link to help the complainant to have direct access to Centralized Public Grievance Redress and monitoring system. By the help of this, the aggrieved customer can place his complaint or any reactions with the authority for a positive and justified solution. Apart from this, there is a number, provided by the Railway, which will help the complainant to register his grievance by sending text message to the Customer Complaint forum.